A fabulous opportunity to purchase this stunning, stone built, detached family property situated in a small, courtyard development of only eight exceptionally high quality homes. 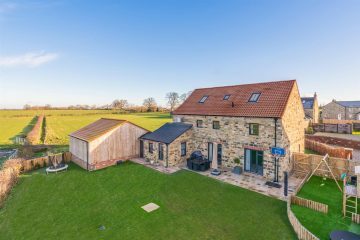 The property offers superbly appointed fixtures and fittings throughout and is set in an idyllic location with panoramic views across open countryside, within easy reach of the amenities of several village including Markington, Bishop Thornton and Ripley. Harrogate and Ripon are also only a short distance away. Tithe Barn has been designed to create a fabulous family environment with well proportioned accommodation arranged over three floors having the benefit of double glazing, high efficiency thermal insulation, LPG central heating and the remainder of a 10 year NHBC warranty from November 2017. The ground floor has zoned underfloor heating and comprises: Entrance vestibule, superb dining kitchen with white quartz work surfaces, a magnificent island unit with inset induction hob, Franke sink unit with boiling tap and Neff appliances including twin oven with inbuilt microwave and wine cooler, space for American style fridge freezer and tiled floors with underfloor heating, through dining room with bi-fold doors, electric blinds and feature window, extremely large living room with corner Rais Q-Be feature, wood burning stove and bi-fold doors, utility room, cloakroom with wc and, from the kitchen, a further sitting room with access to the garage. To the first floor the air conditioned master suite has a large bedroom with far reaching views, dressing room and magnificent en-suite shower room, two further double bedrooms, useful storage and luxury house bathroom. To the second floor are two further bedrooms and a shower room. With two electric roller doors, large mezzanine store area, power, light and central heating boiler. To the rear of the property are good sized lawned gardens with flowering borders, timber boundary fencing and a large flagged area. There is a children’s play area with low fencing and astroturf and further courtyard gardens with newly planted shrubbery and boundary walling. From Harrogate take Ripon Road A61 and continue on at the first roundabout towards Killinghall. Approaching Ripley go straight on at the roundabout and then take the second exit at the next roundabout onto the B6165. Take the second left turning onto Fountains Road/Scarah Bank. At the junction turn right and then left into Drovers Fold. An internal inspection is truly required to appreciate this beautifully decorated and furnished property, appointed to the highest of standards, with high quality carpets throughout, fitted blinds and electric blinds.